This flotilla takes in all the best bits of the South Ionian. From the remote islands of Kastus and Kalamas to the bustling towns on Kefalonia and Ithaca Island, the South Ionian offers the best of both worlds and an unbeatable holiday destination. This is an ideal first flotilla and introduction to cruising. 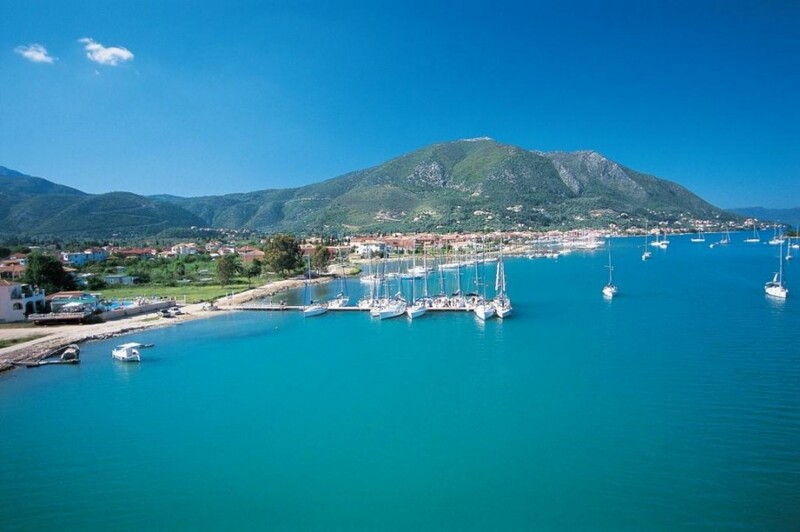 The flotilla spends its first days in the sheltered waters behind Lefkas Island and provides soft sailing that will build everyone’s confidence. The lead crew will decide your next destination based on which way the wind is blowing and where a suitable harbour might be. There are a number of possible routes for this flotilla and lots of atmospheric villages and towns to visit. This route starts at our pontoon in Stena on the outskirts of Nidri, on the east coast of Lefkas Island. The starting point is just metres from the Iris Hotel, with it's stunning pool and small pool bar where owners Christos and Evanthia will offer you a warm welcome. After a short boat brief it is time to relax for the evening. 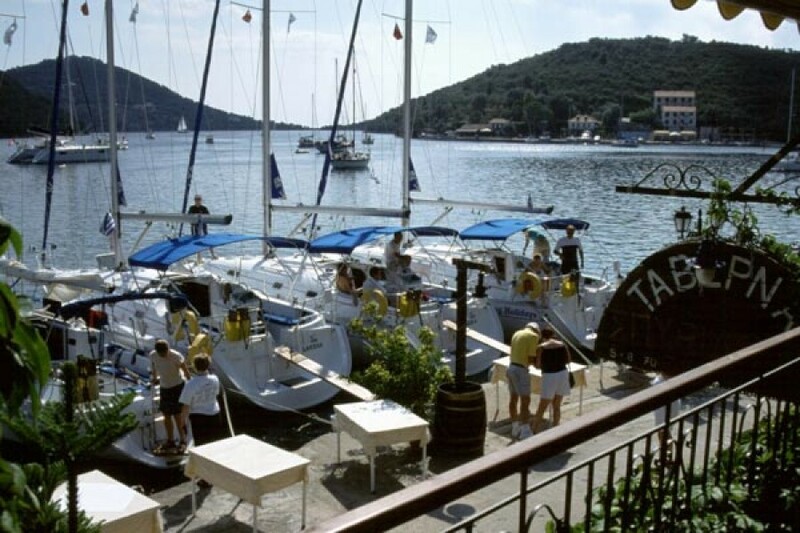 A short walk into Nidri town offers a plethora of Greek dining options or (if a long day of travelling has got the better of you) simply relax at the Iris, just a few metres from your yacht. Your first day will be an appropriately short introduction to your island hopping adventure. This is normally only eight to ten miles, around to a sheltered bay or village harbour on Meganisi Island. One of the highlights in this area is picturesque Spartahori village, perched on the cliffs of Meganisi Island. Steve and Gerry’s taverna at the end of the bay, with a beach on either side, has ‘lazy lines’ for convenience. It is the perfect spot for leisurely swimming. Make the effort to walk up the hill to unspoilt Spartahori village for the view and a cold beer at Lakis traditional taverna - it is worth the walk! You may also spend a night moored at Port Atheni, where you can join in with the traditional Greek dancing. They are always looking for volunteers! From here you can enjoy a walk up to the old village of Katomeri. 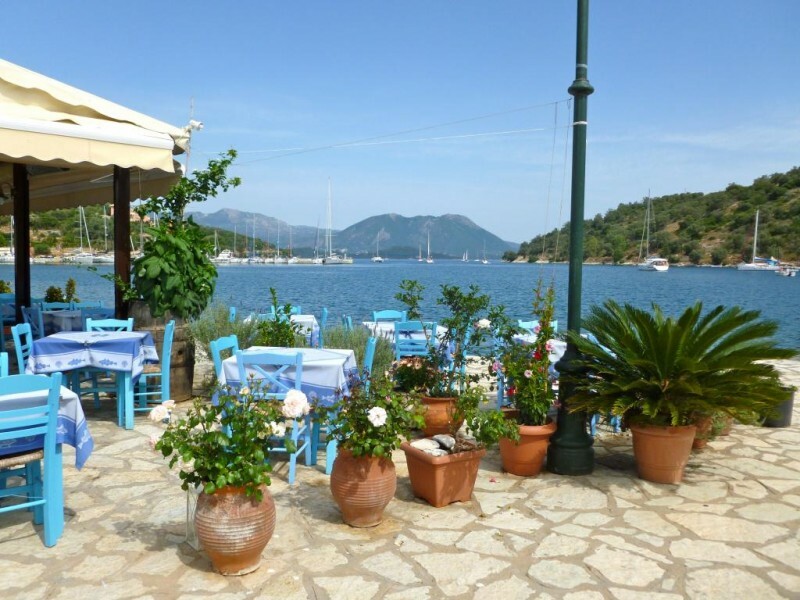 ‘Little Vathi’ on Meganisi Island is also a favourite spot with several excellent tavernas and a traditional village atmosphere. 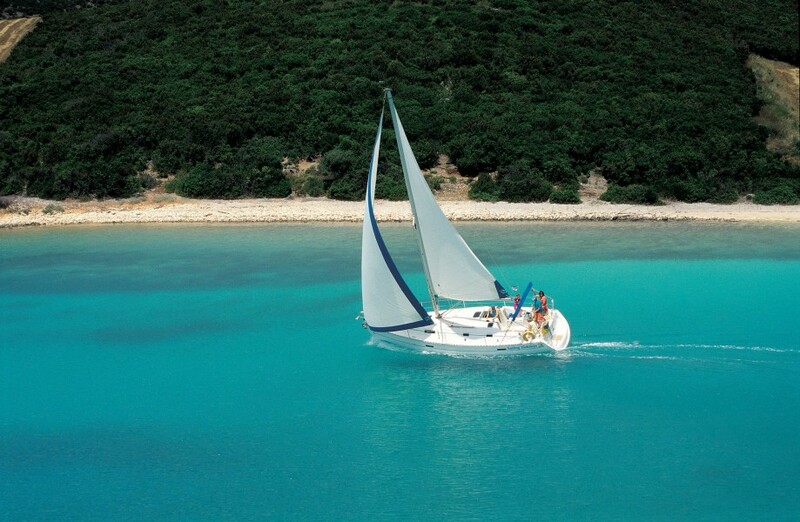 The waters surrounding the Greek mainland north of Meganisi provide the perfect playground for learning to sail, due to the shelter Lefkas Island provides. A swim stop in the crystal clear waters of Goat Bay is not to be missed, followed by an overnight stop in Palairos - the best sunset spot in the South Ionian. Later in the week you may visit Ithaca Island which is the legendary home of Odysseus. Kioni and Frikes, on the east coast of Ithaca Island are quaint villages in which you can relax and enjoy Greek island life! We loved this holiday! If you fancy a week on your own boat, with warm weather and clear seas, this is the way to do it. The lead-crew were all friendly and helpful, even this late in the season. Had a great time, perfect weather, strong winds, boat was in good shape and the lead crew were a lot of fun! Thank you to our skipper - JP, and the team - Ellen and Tom - it was the first time I have rented a boat and taken 3 kids sailing - and we had the MOST WONDERFUL holiday with you - and all your skill, organisation, friendliness and hard work to make sure our flotilla ran smoothly, made our holiday such a joy! We are planning to come again. Thank you all. 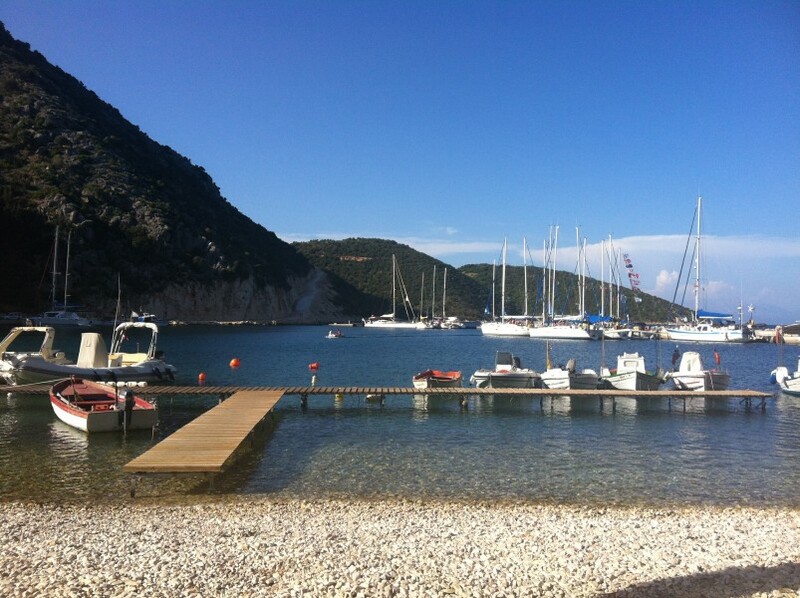 I certainly had an enjoyable weekend, having just returned from one of your incredible flotilla holidays to Lefkas! I was part of the Bedford party living on Oxia for the week, with JP, Ellen and Tom looking after us out of Sivota. The whole experience from start to finish was absolutely superb - the organisation, the food, the atmosphere, the other boats, the harbours and the weather - it was exactly what we were looking for and there's already talk of booking a boat for next year. Fantastic holiday - an excellent experience, from booking the holiday at the boat show to our last day afloat. We enjoyed the you tube videos before we left, so we had a sense of what was coming. The crew were outstanding, nothing was too much trouble - even the skipper diving into the harbour to retrieve someone's lost glasses. We were first time flotilla sailors and will definitely go again with Sailing holidays. Just the right balance of freedom and get-together's. A relaxed, laid back style but a very competent crew made it a perfect family adventure. 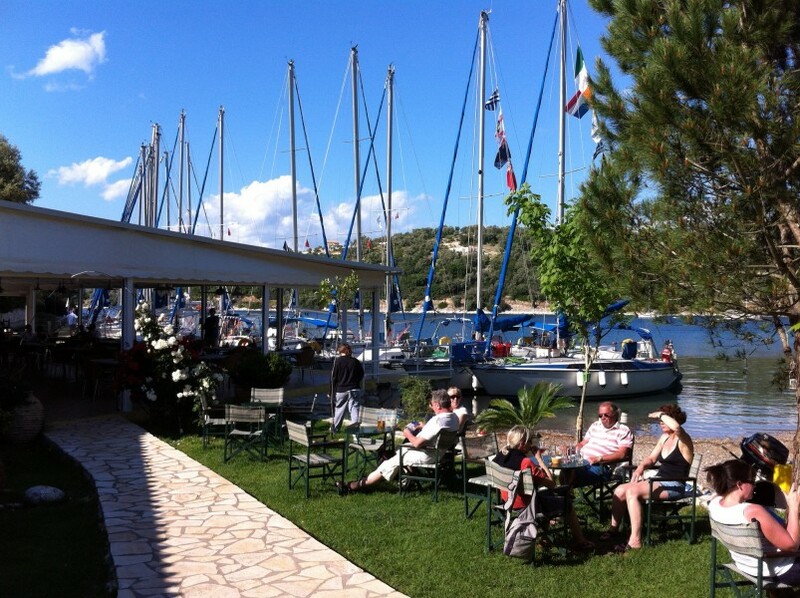 We had a lovely week at the Iris hotel before our 1 week flotilla with lead boat Dessa. Super chilled week followed by flotilla fun and antics. Can't wait to book next years trip! First timers thoughts? OK-complete newbies, learning curve like Everest, def need a can do, go for it, no one's capsized yet mindset. Once you've got over "do they really take complete beginners?" bit, put yourselves in the capable hands of Sailing Holidays and go with the flow. Listen at the briefings, follow instructions and you can't go wrong. And if you do someone will be there to rescue you. For sure. And if you find yourselves atop a reef that you were told was there but you still found because your captain failed to check the deepometer, just sit back, play cards and wait for the lead boat to appear over the horizon... Absolutely the best time ever. Came home and booked again. Took a last minute cancellation 10 days before we went out (I'd been back 4 days from doing a 1 week delivery trip with you and that was long enough back in the UK). Had the Lovely Lead boat Kamara with Twisty, Tim and Stacey. Again a great week and another testament to Lead Crews. Would not really consider a bareboat charter now because we couldn't but you would loose the lead crew which is a definite POSITIVE to the flotilla. Unfortunately being last minute the spread on children on our flotilla was slightly out as the other boats were mainly early teenagers so didn't match with out younger kids in the evenings. Great week though and can't wait for the October Half-Term when we are out again. Hi Daniel, Thank you so much for the note! Chuffed you had a brilliant time. All the flotillas are organised by ages for the Corfu & Paxos Half Term Flotilla so you are in luck! It should be a fabulous week. Thanks again for taking the time to give us your thoughts. Thanks to sailing holidays for making a dream come true. We completed a boat trip around these islands in September 2014. As complete novices we did not think it would be possible to sail our own boat on a similar route, yet Sailing Holidays made this possible. Beautiful scenery, delicious food, and great company, many of whom were also novices. The Skipper (Jake) was inspirational with his calm, confidence building, "can do" demeanour. Naomi excellent organisation made the social side a success, and Engineer Rowan fixed anything that went wrong. We shall return!! 4 in a yacht only one with any experience. we had a fabulous time, the flotilla crew were so helpful and guided us in most afternoons . The views and scenery are amazing and most of it you wouldn't see unless you were on a sailing holiday. I can not recommend this more prefect holiday perfect company, as little or as much support given to make your holiday as successful as it can be. Cant wait to sail again! We had a great sailing holiday! Thanks to Kalamas lead crew. I write to let you know that our family group (three yachts - eight adults and five kids) had a wonderful fun time. The lead crew of Helen. Matt, Pete and Rosie were outstanding. Great to know that an all Brit crew can be great fun. Thank you to your team for a really memorable holiday. We had so much fun and met some lovely people in this group of 9 boats and found a small part of Greece that would otherwise have remained undiscovered for us. Please be assured the Thyamus crew will be back – very soon we hope. We will be recommending you to friends. Thanks for a great week - we would definitely do it again and recommend Sailing Holidays! I just wanted to get in touch to say a massive thank you to Sailing Holidays for the most fabulous vacation – possibly the best we’ve ever had (and we’ve had plenty of really good ones all over the world). 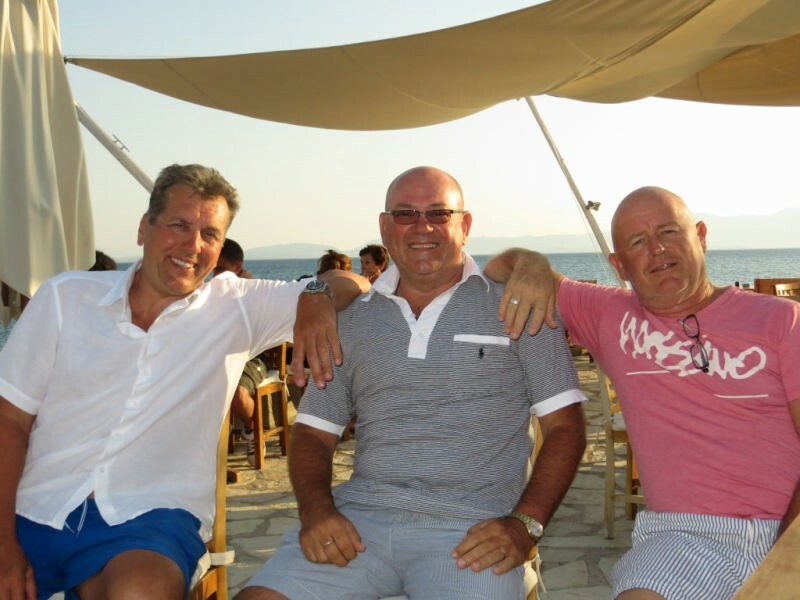 We've recently returned from one of your sailing holidays and would like to say what a fantastic time we had! We were on our honeymoon and the great memory's will live with us forever. Many thanks and see you next year! My wife and I had a wonderful flotilla holiday out of Lefkas from Sunday 9th to Sunday 16th of June 2013. As a result of this experience, we have now booked a similar holiday next year from the 1st of June. We are looking forward to our next Sailing Holidays Flotilla a great deal. Thanks again for a great trip. Dear all, we just need to say a very BIG thank you for making our first sailing holiday, one never to be forgotten. The story starts with our usual family trip to the boat show, beautiful boats, distant dreams and tons of reading matter! Our son had been sailing dinghies for a couple of years but that was the extent of our combined experience! Previously holidays to Greece - spent on the beach looking out to sea at the flotilla that would gather in the bay during the afternoon, mooring for the evening. Walking back to our rooms we could hear the ‘whoops’ of laughter, witness the immediate camaraderie of the crews and the hi-jinks of the kids. So... Back at the Boat Show one stand catches our eye and we grab a brochure. Back home, we spend hours trawling through and eventually come to your brochure! We deliberate, we decide, then call and a certain Barrie answers - we’re booked. The flight out... An observation - half the plane are reading ‘Sailing Holidays’ Harbour Guides and Yacht Manuals. My wife rummages in her bag “best we read it again she says!” We needn’t have worried - we were met by a top team and whisked off to our base where we were introduced to our yacht for the week. To calm our nerves we head straight to the bar and are met by our hostie Holly who could not have been more welcoming. Along with Skipper Freddie, and engineer Jake (team Helen) gave us just the briefest glimpse of the week that was to come. We could not wait. Sail training... To settle us in we booked a day skipper by the name of Patrick and off we went to Meganisi for our first fantastic days sailing. We learnt so much from Patrick who gauged our levels of experience (or lack of it) and helped us accordingly, the confidence he instilled was nothing short of incredible. After a diving competition off our beautiful yacht, moored up in a pretty little bay we all enjoyed a cup of tea before heading off to our next nights stop to celebrate our 1st voyage and meet our flotilla! 7 days, 7 harbours... In 7 days we visited 7 beautiful tucked away harbours, met some interesting characters, one of whom guided us into Vasiliki in lively winds his name was George and we’d like to thank him – some interesting manoeuvres. That evening we all ‘bonded’ and our son was welcomed into the Sailing Holidays team of skippers - very proud Mum and Dad. 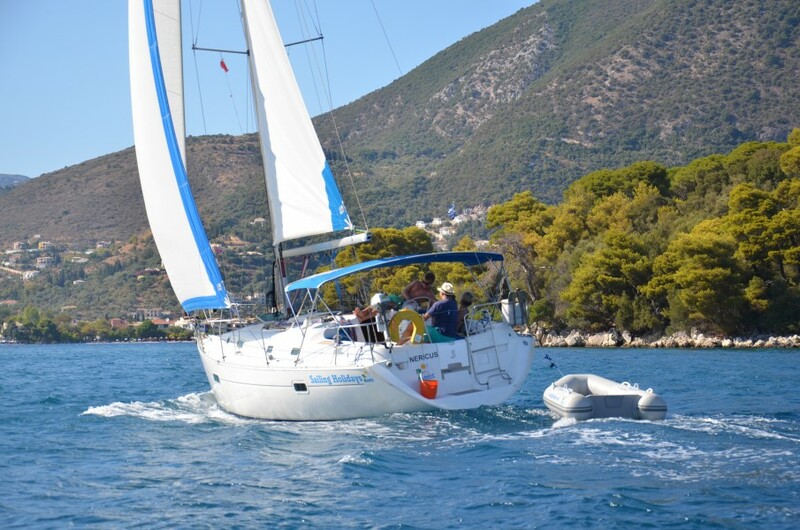 Dear Sailing Holidays, I would like to say having just returned from our one week Lefkas holiday starting at Nidri and finishing at Sivota, (26/5- 3/6) what a wonderful holiday my family and I have had. There were eight of us your Bennetau 40. I felt your company was very professional from start to finish and the team we were with, Freddie, Holly and Jake made our holiday very enjoyable and were a credit to your company, the three of them could not of been more professional, friendly and pleasant. All the boats were in superb order and the choice of ports we went to were amazing. We were initially recommended your company by a friend and we will certainly recommend your company to others. Well done all round to your company and well done to your lead crew who made our holiday even better! We feel the we must register what a fantastic lead crew you have on lead boat 'Helen'. Jake, Holly and Freddy are a credit to themselves and to your company. They always had a smile on there faces, were always very polite and nothing was to much trouble for them. The advice they gave was always spot on. We had a fantastic holiday. Thank you all very much! 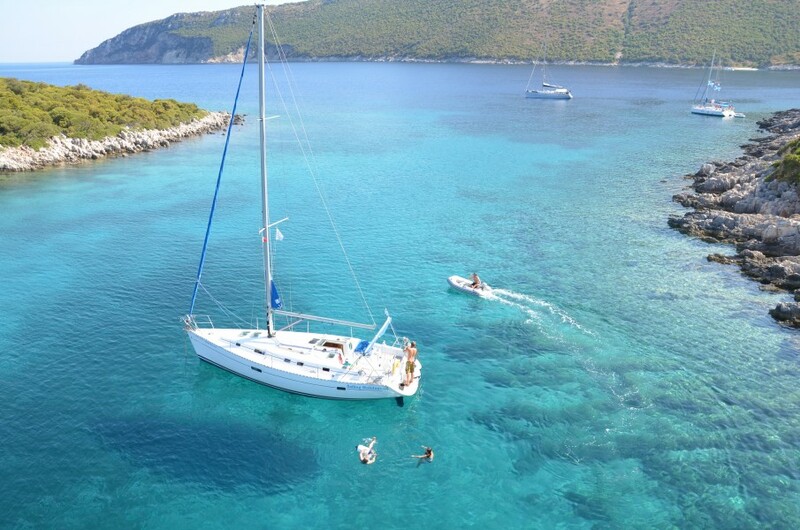 Hi Sailing Holidays Just thought we'd would drop you a line following our return from the Lefkas 1 week flotilla on 9-9-12 The holiday has been fantastic in every way and exceeded our expectations. In particular we were overwhelmed with the attentiveness, ability and professional approach of our Vassia lead crew (Stew, Sarah and Jamie). Their skill, knowledge, advice, enthusiasm and patience were central in providing a superb first sailing holiday experience. Without doubt we will be booking again next year with Sailing Holidays (for 2 weeks) We would be grateful if you could pass on our sincere thanks to the Vassia crew and support staff.